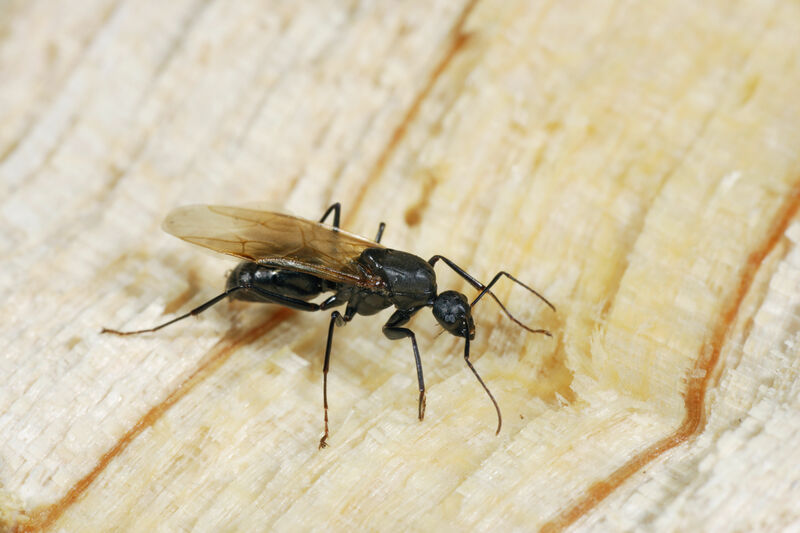 Carpenter ants are very common in the Pacific Northwest; they nest in wooden substances, burrowing into trees and logs in nature or furniture, walls and doors in your home. 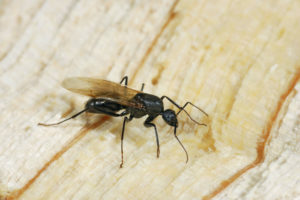 Carpenter ants are often mistaken for termites because they also have wings and can damage the wood in your home, but unlike termites they don’t actually eat the wood; they just burrow into it as a nest. You’re most likely to see carpenter ants between spring and fall, especially after dusk. They love damp weather, which is one reason they’re so common in this area. Keep your kitchen clean. Do dishes promptly and wipe down your sink and counters regularly. Cover any leftovers before storing them – even in the refrigerator. Keep your garbage bins covered and, if possible, away from your home. If you spill anything with sugar, such as juice or syrup, clean it up right away. Keep trees, bushes, plants and leaves pruned and away from the home. Make sure openings into your home, such as pipes or wires, are sealed up. Try to keep your home’s wood as dry as possible (I know, it’s hard in the Pacific Northwest). Replace any wood that’s water damaged or decaying. Store firewood away from the outside of your home and check each log carefully before you bring it inside. The first step to addressing carpenter ants is an inspection. 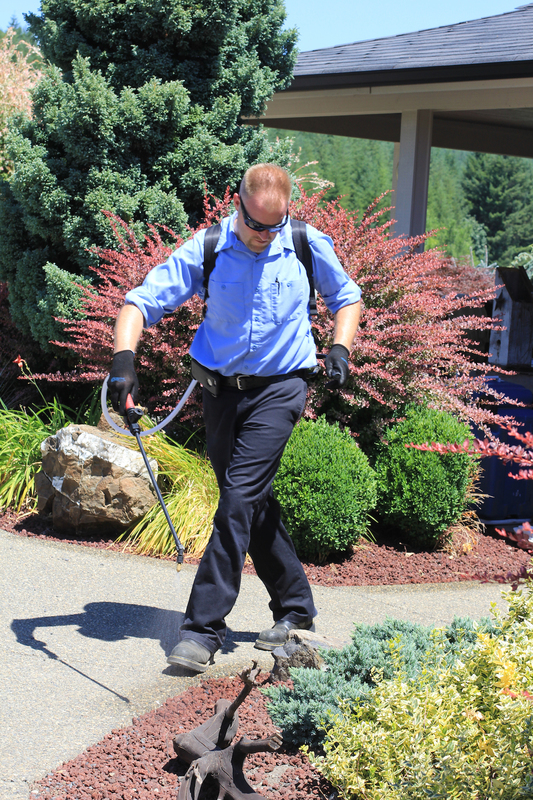 In addition to asking you what you’ve seen and heard, we’ll carefully look around the exterior of your home for signs of activity, like ant trains and/or frass. This will give us a good idea of the size and maturity of the colony. Next, we’ll create a custom treatment plan for your home. 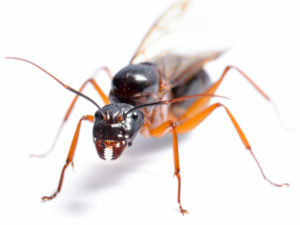 The most common procedure for this type of pest control is a Standard Carpenter Ant Drill and Treat. This means we drill a 5/32 hole into your home’s siding every 16 inches. These holes do not cause structural damage or allow water to seep in; in most cases they don’t even need to be filled. Once the holes are drilled, we use a specialty 4-way injector to apply a specialized pest control product into wall voids. We use the same product to apply a barrier spray of the home’s exterior. The product we use in this type of pest control is non-detectable transferable, which means the carpenter ants won’t realize they’ve been treated and will carry it back into the colony, passing it along to the other ants. We often see results within a week, but in rare occasions it can take up to 45 days.